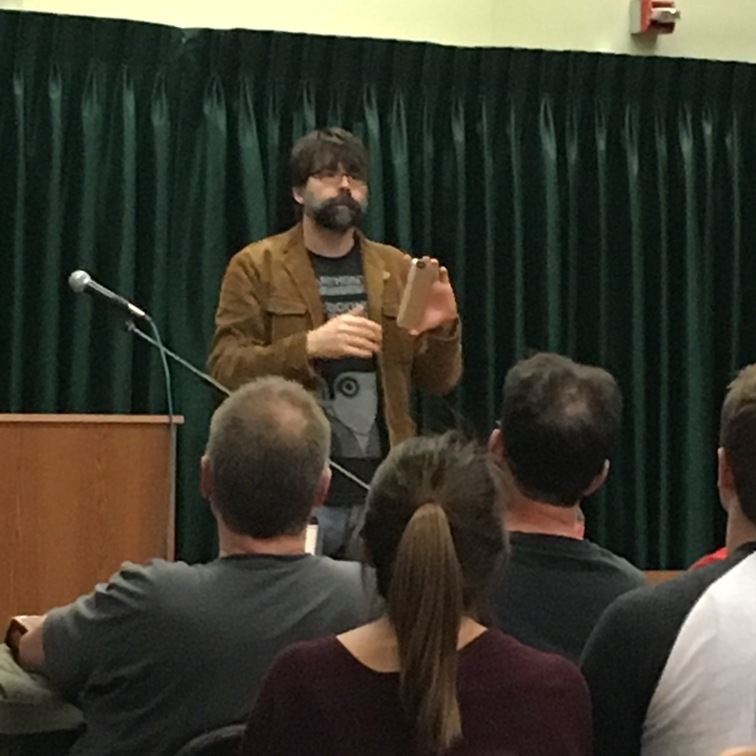 —Joe Hill takes questions before signing at Vroman’s in Pasadena on May 25. 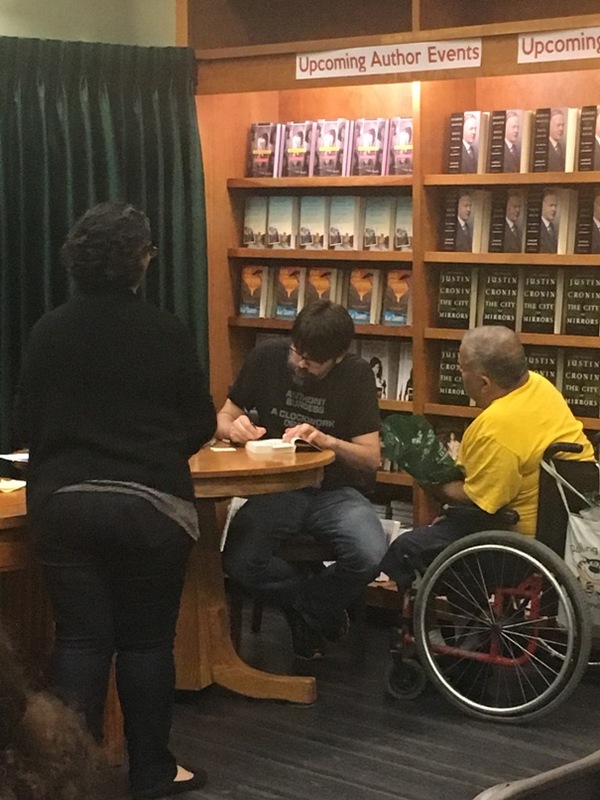 By John King Tarpinian: Joe Hill is doing a book signing tour to promote his new book, The Fireman. (In the book he admits he stole the title from Ray Bradbury) This is my third encounter with Stephen’s boy, who has made quite a name for himself on his own. 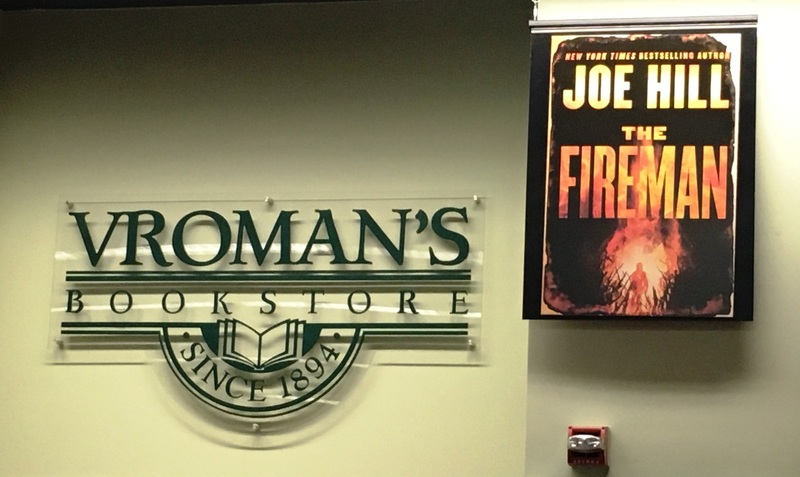 Joe’s pen name was chosen by him to distance himself from his dad so people would not think he was just “writing” on his father’s coattails, so to speak. Hill is a shortening of him mother’s maiden name, Hillcrest. 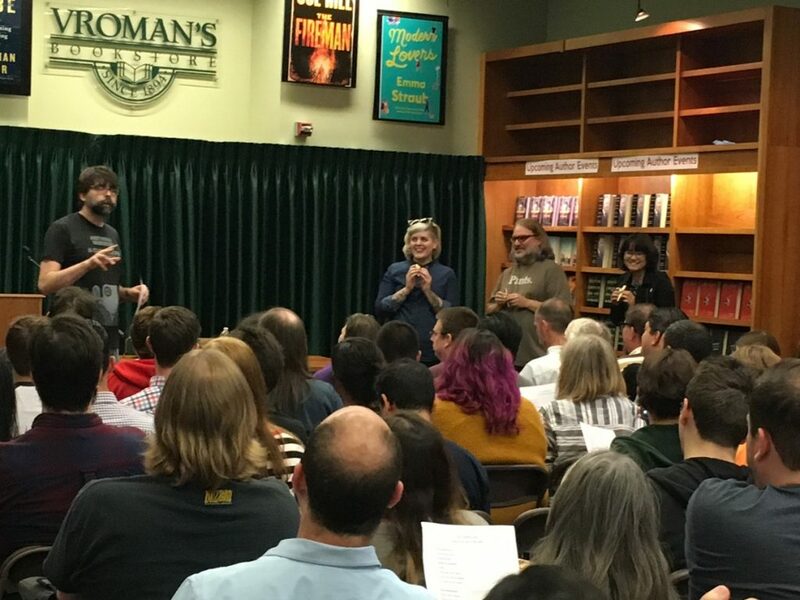 Wednesday’s signing was in Pasadena, CA with Thursday’s being in San Diego. My first encounter with him is at ComicCon 2009. I was part of Ray Bradbury’s entourage and another in our group noticed Joe across the hall. I went over to ask Joe if he wanted to say hello to Ray, not knowing he had never met Ray. My second encounter was when Joe talked at the ComicCon tribute to Ray after his passing. What I took from that as a child his dad would read The Halloween Tree to him and his siblings on Halloween. 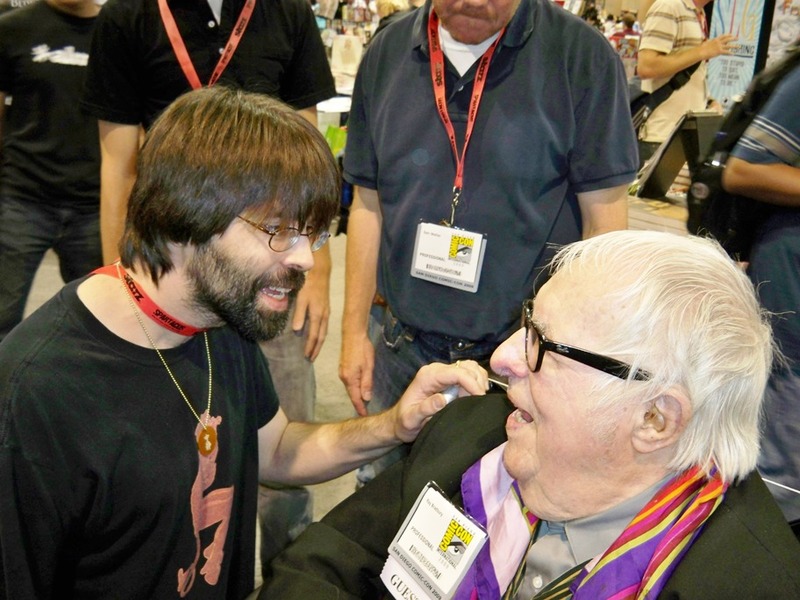 Joe Hill and Ray Bradbury at Comic Con 2009. Photo by John King Tarpinian. The man is very personable, a delightful speaker that kept the audience fully entertained. He started his talk by giving a brief history of his literary works…as if the audience did not know. He then took a panorama picture of the audience that he posted on something called Twitter. (If you go to look I am the fat man wearing the suit.) Joe then read from his new book. 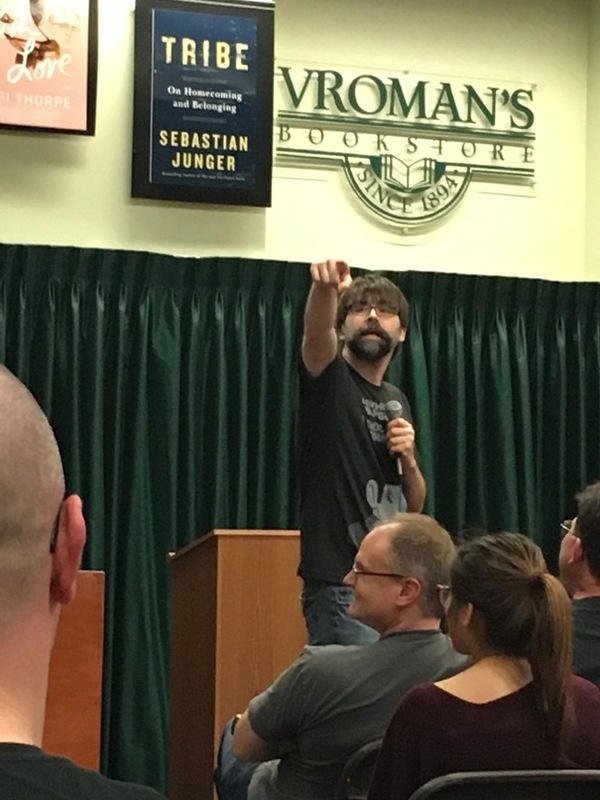 Joe Hill takes photo of Vroman’s audience. Among the things we learned is that he is working on a spec. script of Locke & Key for television. Just before the event he received a text telling him that The Fireman is entering the New York Times Bestseller list at #1. At that news the audience gave him another of many rounds of applause. One of his guests for the evening was Canadian comic book illustrator, Kate Leth. She was constricted to participate with the kazoo band. Among her works is Adventure Time. Joe Hill gets ready for the kazoo performance. Kate Leth is in the center, standing. Joe selected three people in attendance, at semi-random; to receive custom made Fireman Kazoos and then lead the audience in renditions of “Hey Jude” and “Chim Chim Cher-ee.” After that, he held a Q&A until our hosts decided it was time to start the signing. The rules of the house were you could bring three things from home for each copy of The Fireman you purchased, more than fair. This entry was posted in Like Show Business and tagged Joe Hill, John King Tarpinian, Kate Leth, Ray Bradbury by Mike Glyer. Bookmark the permalink. The last picture is fine. I don’t know if this is just a peculiarity of the iPads (which can be fairly peculiar sometimes) or if there is something generally messed up with the picture metadata or something but I thought I would mention it. Cat: There’s probably some data in the pictures causing them to display differently for you — and I can probably fix that. Will go work on it now. I made copies of the problematic photos, removed the exif data, and uploaded them as replacements. Tell me if they are displaying in the right orientation now. While I admire him for not wanting to trade on his father’s fame, there’s nowt he can do about having his father’s face. Someone could probably write a scary horror clone story. They look fine now, Mike! Thanks!